If the last one is anything to go by, we Brits need to be prepared for a cold, frosty and long winter. 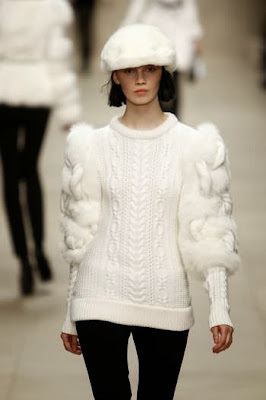 So, fashion has given us a helping hand and brought all things warm back into trend. Fur is one of them. Like it or loathe it, there is a no doubting how toasty it is. This jumper (above) is probably one of the most beautiful things I've seen this season (bar a very cultural weekend in Granada with some of my best friends for one of their 30th's last weekend). It's October and I'm already sniffling away, so I've been on the hunt for some faux/cheaper versions of the fur sweat look. Synthetic fur can be hot and smelly - so I've recommended ones I've actually tried on. I ended up going with the cheapest (miracle) from And Other Stories with the Alpaca/fur arms. Amazing for £45. The Topshop reverse Dalmatian print sweater is awesome, and has a matching skirt (which would look super with a white shirt and killer heels) for £90. 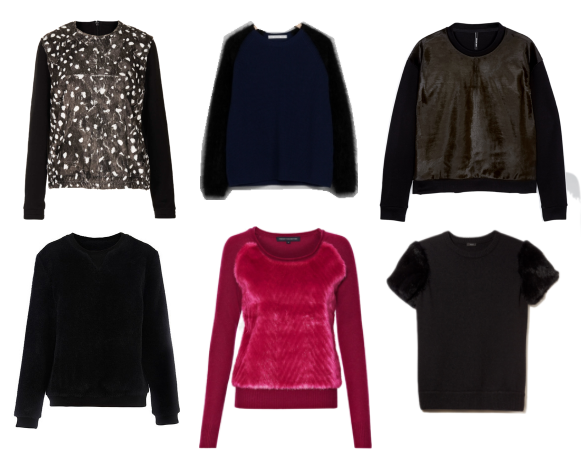 The rest are all damn good, particularly the Whistles sweater, £295. Not pictured is a great one for under £20 from New Look, for some reason it didn't want to clip to my image board - cream, casual and pretty damn good. Doesn't feel too synthetic either. 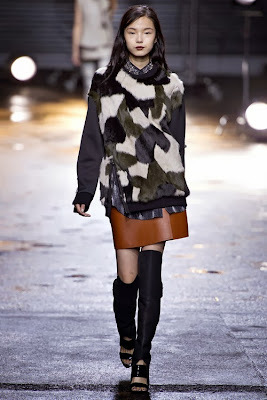 Two of my favourite designers, Burberry and Phillip Lim both had their take on the look. Lim as usual went for a more military/utility look whilst Burberry went a little more luxe-traditional with an adapted fishermen's knit sweater (also in the first picture). If you've got a spare (several) hundred quid then you can find them here and here. Lastly on the subject of fur, I really cannot leave out this gorgeous Antipodium dress with fur collar. It's from the Australian's new collection at my wardrobe and I've been lusting after it for AGES. Check it out here.